Fish is a command-line interpreter with interesting additional features. 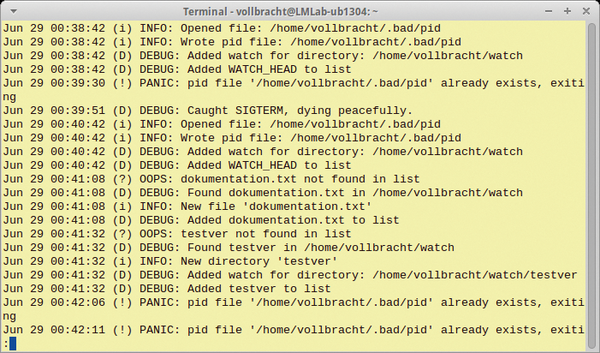 At first glance, the shell looks much like Bash, but this changes when you enter the first command. Thanks to syntax highlighting, the program emphasizes incomplete commands in red, correct commands in blue, and parameters in turquoise. Fish also tries to guess commands and parameters and makes suggestions while you are typing by drawing on the history of the current session. The developers have also implemented tab completion, pipes, and redirection. For a surprise, try typing help. The shell does not display a list of available commands but opens the online help in your default browser. This browser also launches when you type fish_config. You can then click to turn features on and off and view the history. A look at the project page – and especially the tutorial – is recommended, especially for users who are interested in scripting with Fish. 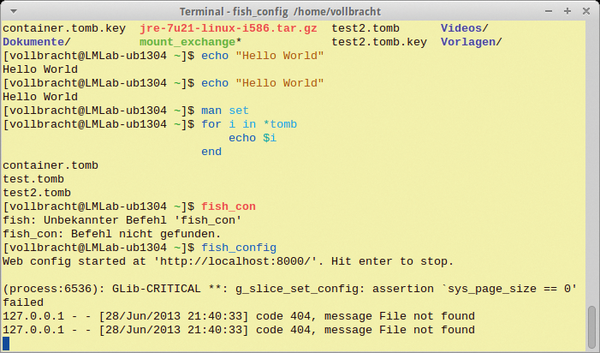 Fish is an interesting alternative shell for Linux and OS X users. Besides the standard functions, the tool impresses with syntax highlighting and autocompletion suggestions as you type. The backup daemon monitors a user-defined directory, creates MD5 sums for newly added data, and then copies the data to another folder. The the tool does not perform the actual data backup. You need another program to back up the target folder. Bad takes changes in subdirectories into consideration, but only up to the first level. Bad learns from the kernel's inotify feature about changes that have happened on the filesystem. In a personal configuration file ~/.bad/config a user can define watch_dir and backup_dir to specify which folder the daemon monitors and where it copies new data. Additional settings are defined in call parameters. For example, -d switches the program to dry-run mode for test purposes; -l changes the log level, -n disables hashing, and -N enables recursive backups. The daemon does not log its actions in the default directory /var/log; rather, it uses the users' home directories in the ~/.bad/log file. Bad is still a young project, and so far it only has a few advanced features. However, the tool has potential and it's worth keeping an eye on. Anyone looking for a handy blog engine should take a look at Blink. After unpacking the archive, copy the cgi-bin directory to the documents folder on your web server and make sure the CGI files it contains are executable. Blink manages several blogs in directories below cgi-bin/blink. If you want one of them to record comments, you need to create an additional .comments directory in the blog folder. If you want use CSS, you must modify the HTML code in the script; the README.blink file explains how to do this. 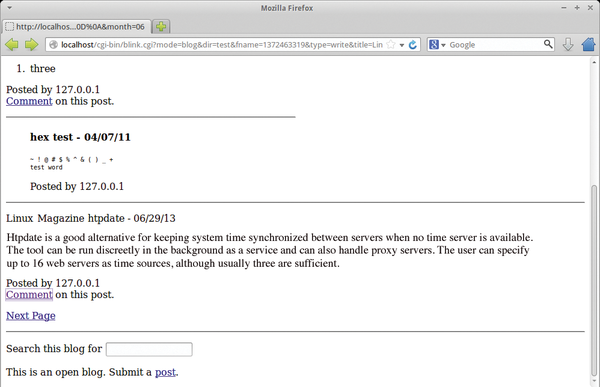 Blink sorts blog entries by their modification dates. The post link lets users open a form in which to compose texts. Similarly, a click on Comment pops up an input field for comments. The text area is limited to 500 words in both cases; the engine understands HTML tags and entities. As a protection against spambots, users need to type the current month before posting. A simple search function is also included. The slim blog engine is especially suitable for smaller networks or home computers. It lacks sophisticated access controls, so admins will want to consider carefully whether they want to operate Blink in the open on the web.